Gillian Young was a costume designer. Her father was a respected officer of the police force. Someone murdered him and as she began to investigate, she found indications that he was leading a double life. She came across a photo of a young woman, train ticket stubs for secret trips and a receipt for a large sum of money. In hopes that her father was innocent, she disguised herself and went undercover in search of the truth. Award-winning and bestselling author Sandra Byrd has published four dozen books in the fiction and nonfiction markets, including Mist of Midnight, Bride of a Distant Isle (A Romantic Times Book Reviews Top Pick), and her most recent, A Lady in Disguise. For nearly two decades, Sandra has shared her secrets with the many writers she edits, mentors, and coaches. She lives in the Seattle, Washington area. "Capturing a distinctively gothic feel, the third standalone novel in Daughters of Hampshire series beautifully pairs mystery with romance. Byrd's research into the traditions, culture and dark underbelly of England in the 1800s resonates on each page to help readers become immersed in the era. Descriptions of lavishly sewn gowns and the fascinating world of the theater are brought to life by Byrd's superb writing." "This Victorian inspirational romance features everything fans of the genre expect: a plucky, relatable heroine with a visible Christian faith, a dashing but kind love interest, and a mystery element to foster tension until the d&eacute;nouement and 'happy ever after' epilogue." "With impeccable research and elegant writing, Sandra Byrd brings Victorian England to life in her latest novel, A Lady in Disguise. Readers of historical fiction will be delighted with the romance, mystery, and inspiration in this page-turning story, and they will be kept guessing until the end to see how the heroine will uncover the truth behind her fathers death. Well done and highly recommended!" "Sandra Byrd's talent for keeping readers on the edges of their seats once again shines throughout this well-written tale. Brimming with mysteries from the very first page, lovers of historical fiction and historical suspense will adore discovering the startling truths alongside the heroine in A Lady in Disguise." "Fans of historical Victorian and Gothic romance will feel right at home in these tightly-spun, suspenseful pages. Highly recommended!" A Lady in Disguise has everything I love in a good read - a page-turning mystery, engaging characters, shadowy figures, the hope of romance (or is the attraction misplaced? ), and many secrets to be revealed. I was engaged to the very end!" 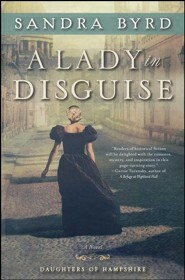 "Sandra Byrd's latest novel, A Lady in Disguise, explores the darker side of Victorian London. When Gillian Young's policeman father dies in suspicious and incriminating circumstances, she sets out to investigate the true facts of the matter. Helped along the way by the charming Viscount Lockwood, Gillian uncovers a trail of secret letters, mysterious money, and turncoat friends, bringing her to the realization that although the truth is there, sometimes it is hiding in disguise. This is a strong conclusion to the Daughters of Hampshire series and a novel I would heartily recommend to lovers of romantic suspense." "The vivid historical details and thrilling plot make A Lady in Disguise a perfect choice for readers of both historical romance and romantic suspense." I'm the author/artist and I want to review A Lady in Disguise.